It's funny because I felt like maybe I wasn't very productive quilt-wise this year...but when I created the mosaic of all my finished projects for the year, I was actually pretty surprised! 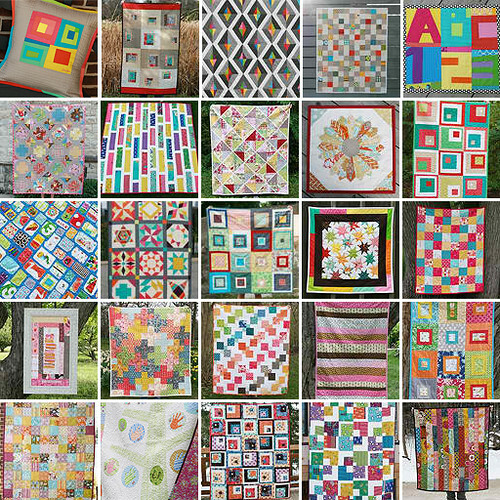 You can find links to all these projects on the Quilts tab at the top of my blog header. I think if I could make one statement about 2011, I would say it was the year I discovered how much I love working with solids. I will always be a sucker for prints, but there is just something about making a quilt using all solid fabrics that really inspires me. One of the areas that has really grown on my blog over the last year was the Tutorials section. 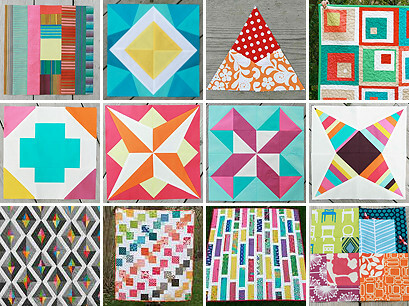 I've had a lot of fun designing quilts and blocks...as well as cohosting the Summer Sampler Series. You can find links to most of these projects and tutorials on the Patterns/Tutorials tab above my blog header. The only exceptions are my Prism quilt, Rainchino Rails quilt, and Boxed In quilt block which are all in publications. Probably the biggest highlights of my year were attending Malka Dubrawsky's Improvisational Piecing class and the Sewing Summit. It was so fun to not only take classes geared towards modern quilting, but meet people who I had only "known" from online. I'm not sure if I will accomplish all of these...but we will see what next year holds. What are your goals for 2012?